Crossed the Columbia River from Oregon into Washington. It is a big industrial type river where large commercial vessels are transporting goods. It was similar to the Mississippi in this regard but it seemed cleaner. There were many fishermen on the river in small boats so obviously it is healthy enough to support normal fish lifecycles. In the immediate area though there was nothing to look at. It was all commercial buildings and heavy equipment riverside so we moved on the next morning. The Crow Butte park campground was extremely crowded and cost $15 to $25 per night. It was heavily controlled and is easily protected since it is technically an island. This is the kind of place we avoid so upon checking it out we left. This campground would make a great campground for an avid fisherman with a private boat because it had numerous boat launches within the campground itself. And if you stay here your truck rig and trailer would be somewhat protected while you are gone all day fishing. Spent the night in Prosser Washington just over the Oregon border about 300 feet off the road under the power lines. It was quiet and we were never disturbed. It rained all night making for great sleep. Between the noise of the rain on the metal roof and the fact that nobody would probably be out to check on us in the rain made it especially comfortable. Above: Picture taken while driving over the mountains looking towards the valley of Prosser Washington. For most of our Oregon Washington Canada trip our timing was right on. We don't necessarily make hard and fast plans as to where we are going to stop or start each day. However, we definitely make sure we don't overdo it where we rush through a spot trying to cram too much stuff in the daylight hours available. And we make sure to find a spot to sleep before nightfall. We spent a nice quiet morning strolling through the beautiful ten acres of the Yellow Rose Nursery. Very easy to find just off the interstate at exit 80. It was like admission to an exotic botanical gardens for free. 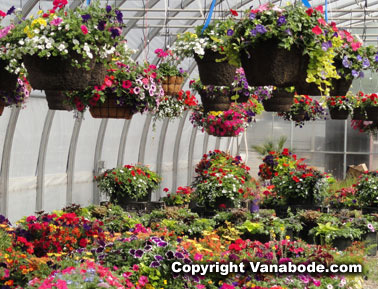 The morning was a little chilly but the walk through green houses and rows of flowers started the day off in good spirits. Then we headed just a couple of blocks over to Vintners Village where we tasted some fabulous Washington wines and ate al fresco on the patio of one of the wineries. You can't miss it from I-82 just follow the signs to Vintners Village and you'll be all the better for "stretching your legs". 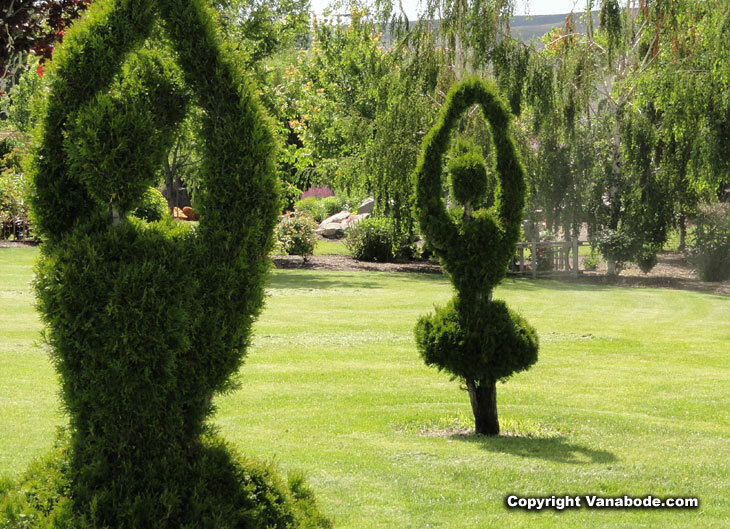 Above: These lovely topiary ballerinas are not at the nursery but somewhere around there and near the cluster of wine tasting facilities. This entire area was so beautifully landscaped and the regional foliage we found quit unique for us coming from Florida. You won't find too many palm trees here. 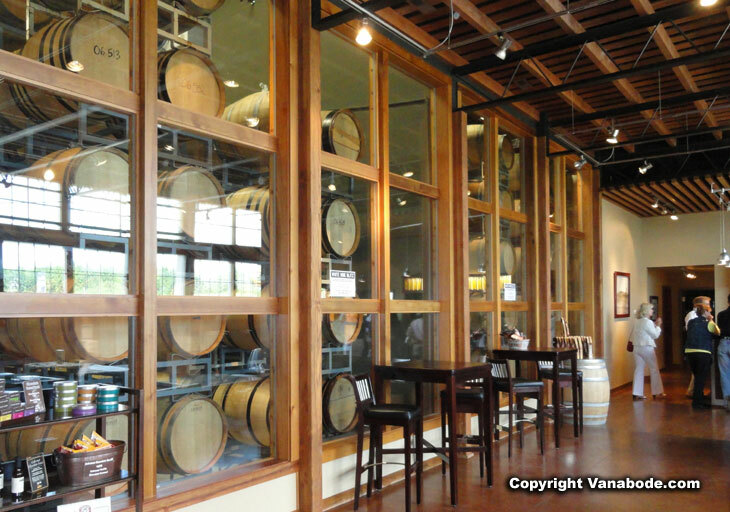 Vintners Village is situated in Yakima Valley's city of Prosser. It is a well groomed and fairly new 32-acres with over 12 wineries to visit. Some are only tasting rooms and others are full functioning wineries with fermenting, aging and storage space. To get around the plan is to park your vehicle in one location. 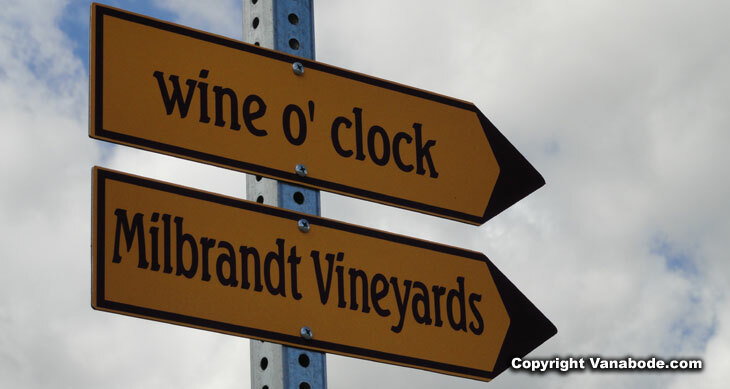 From there take the trails that meander to all of the wineries. Walk, bike or drive your golf cart to get around, it's a fun way to experience the fresh air of Yakima Valley while tasting the every growing and popular wines of eastern Washington. And like most all wineries that you visit they also offer foods like cheeses, breads, oils and vinegars for your snacking pleasure with a newly purchased bottle(s) of wine to be enjoyed on their outdoor patios. Vintners Village is growing with specialty shops, Bed and Breakfasts, and cheese shops. Above: Here we bring our Vanabode eating style right to the table. 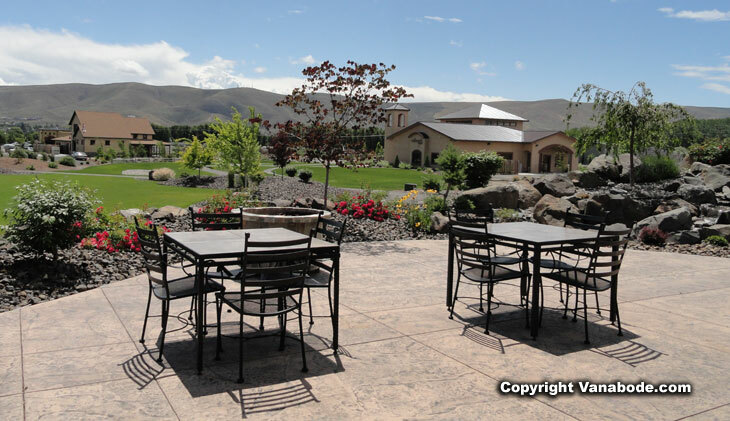 This is part of an outdoor cafe setup for wine customers at Willow Crest Winery on Merlot Drive near the I-82 highway. Notice leftover pizza from Pendleton Oregon. There is applesauce and all the goodies for making a fresh cut salad with our very own balsamic reduction and olive oil for the dressing and dipping sauce for the pizza crust. We purchased some Willow Crest wine. The Rieslings were very smooth and the Rocking Rose was sublime. The tastings here were free since we only had 3 tastings. Above: The beautiful interior of a winery in Prosser. I love they way they are bringing the barrels of fermenting wine to the front of the store instead of being hidden in the back. They are just wooden barrels on racks but something about seeing them makes me feel earthy and content. Even before I was into wine I liked the look of wine barrels. Above: A wine bottling trailer on site at a local winery. The light you see at the end of the picture is the entrance and exit of the bottles. The empty bottles enter this 53' stainless steel trailer empty and they go through a typical bottling process to get the finished product. 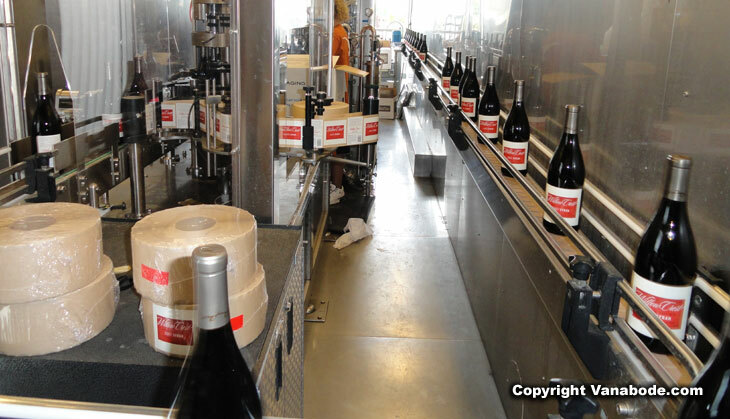 On the conveyor belt the bottles are filled, corked, labeled and at the end someone boxes them up. I was allowed to look in and take a few pictures. Above: Just one of the many fun things to see and take a picture of around the Village. At least they tell you where you want to be and the time of day to be there. Wine O' Clock is actually a wine bar and restaurant, a very popular place to be. Later in the day we traveled north through Parker, Union Gap and into Yakima. We did not take the interstate for this leg making it a less stressful drive and getting into the local scenery. We stopped at a few fruit and novelty shops along the way. From Yakima we did take I-84 to Ellensburg as it was getting late and we wanted to find a place to stay the night before it got too dark. Before bedding down we had dinner at Taco Del Mar. It was a fun place for a quick bite of Mexican fare. And, we were right next a coffee shop for the morning caffeine. The first fews days of driving north through eastern Nevada and Oregon felt like we were the only couple left on earth. And now that we have reached civilization with an interstate, wineries and movie theaters this was actually a quiet and relaxing day from Prosser to Ellensburg Washington Vacation.